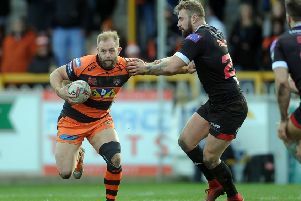 Despite Castleford Tigers’ runaway League Leaders’ Shield victory only two of the club’s players have been selected for England’s World Cup squad. Scrum-half Luke Gale and back rower Mike McMeeken have been chosen, but there is no place for Super League’s top try scorer Greg Eden nor Tigers skipper Michael Shenton, both of who were in the Dream Team. Outstanding performances from Paul McShane and Adam Milner over the year have also not been rewarded with World Cup places while other notable absentees include Wigan’s Sam Tomkins and Hull’s Marc Sneyd. Warrington Wolves, who finished outside the top eight, have four players in the squad to Castleford’s two. All of England’s Rugby League World Cup matches will be broadcast live on the BBC.